The electroforming process in the most simple terms is this: you paint an object with a special conductive paint, suspend it in a solution with some copper pieces ("anodes") and then run a small amount of electricity through everything. 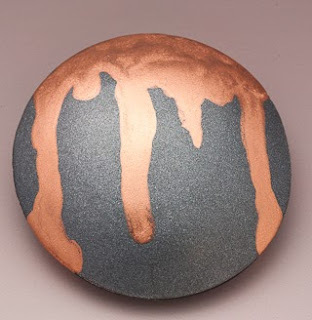 Copper is removed from the anodes and deposited on the conductive paint on your object, the "cathode". To experiment with the technical aspects of electroforming, I dug a few pieces of baked clay from my reject box and got to work. On my first attempt at electroforming, I had the amps turned up way too high and got a very grainy, brittle, and breakable result, so this time I turned it very low. 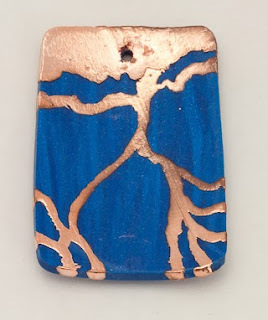 Most of the gorgeous lampwork items I've seen have a fairly heavy coating of almost corroded-looking copper - lumps and bumps - which I love, but I wanted to see if it was possible to get a thin, flat, and even coat. The conductive paint can be thinned for spraying, so I thinned it somewhat and applied it to this earring. I think I thinned it too much, and apparently the paint doesn't like going around sharp corners because I failed to get copper deposits all the way around. As I mentioned, this was a reject piece and I had not sanded off the sharp cut edge. I rinsed the piece in distilled water, dried it and reapplied some thicker paint making sure it was thick where it goes around the edges. I definitely think rounded edges would be a good idea. I also wanted to see how detailed the design could be using thin lines so I kind of scribbled a bit. The electroforming process imposes some design limitations. You can't do polka dots, for example. All areas of paint must be connected so that a continuous circuit is formed. Also, the copper does not stick to the object it is on. You can't just paint on a bead cap because it would fall off. The object must be "caged" in some fashion. I think of it sort of like wire wrapping - you have to have enough copper around the object such that it can't "fall out". Also, since the copper has to go on the back as well as the front to keep from falling off, you have to think about designing the back. You should, but I didn't. I was in a hurry to try this process so in these examples, I just started painting without a plan. 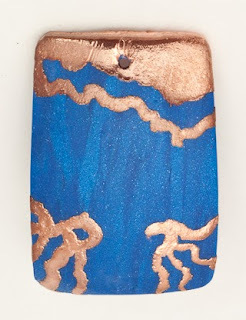 Hollow lentil bead painted with conductive paint. My funniest experience was with an old hollow lentil bead I had laying around. I thinned the paint enough so that it would run, let it run down the front of the bead and then connected it in back. I thought it looked kind of cool. After it dried, I tried to electroform it but the darned thing wouldn't sink even after I held it down in the solution to let it fill up. I even took a hypodermic needle and injected it with solution! Finally I hung a weight on the bottom. That kept it down in the solution but with all the manipulating I scratched off the paint in enough places that nothing was deposited. Now I have two blogs.